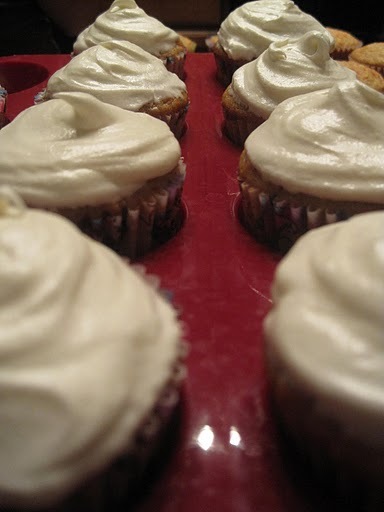 cream cheese frosting – nomnom…Cupcake! … when they are made out of carrots! 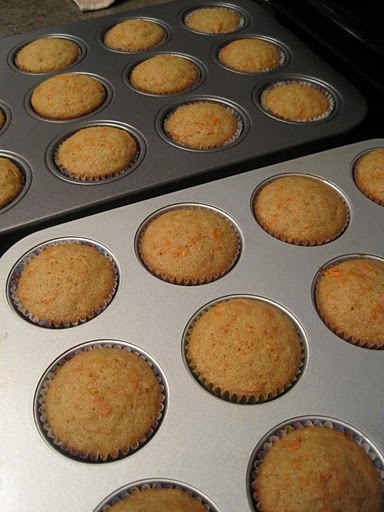 My buddy Dan requested carrot cake cupcakes for his birthday. Seriously, I love carrot cake. But I honestly thought that other people didn’t, and that it was something you’re just born with tastebuds for. Like coconut. Anyways, I leaned on good ol’ Martha Stewart for some guidance with this one. It’s a terrific recipe, but just reading how much sugar in it made me cringe. I always do a little less than, because it tastes the same and the frosting definitely makes up for 1/4-1/3 less cup sugar in the batter. As far as I know, no other baking catastrophes have resulted from a little less suga’ so that’s how I’ll leave it. 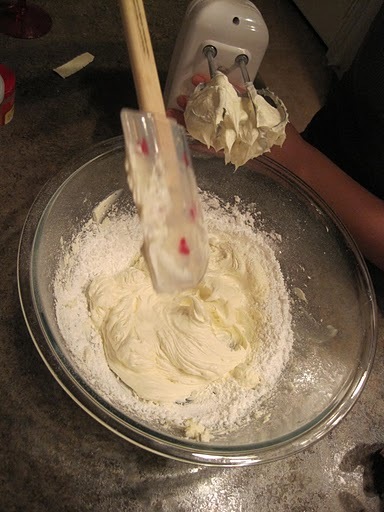 Whisk wet ingredients together in a bowl (includes carrots). In another bowl, dry ingredients. Stir dry ingred. into the wet ingred. Bake till toothpick comes out clean, 23-28 min. (I believe mine were good at 23 exactly)…. Cream butter and cream cheese with electric mixer till light n’ fluffy. Add in powdered sugar, a little at a time, then vanilla. Yum! Megs and I baked these at her place, so that’s bonus #1: A different setting with non-fluorescent lights in the kitchen for photos to follow. Bonus #2 is…. the photos weren’t taken by me! These were taken by none other than Miss Lauren, who made the cupcakes look gooooooood. Thanks to these girls! Let’s get the show on the road… First things first, grate the carrots. 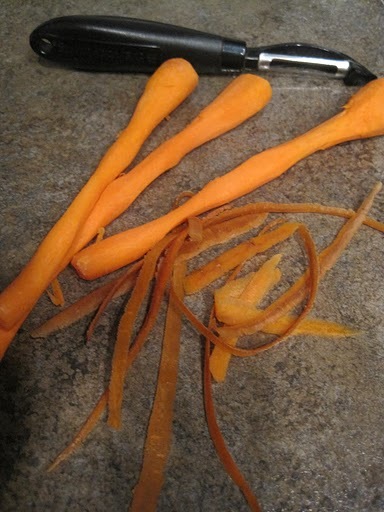 Yep, I use a peeler. I find that grating is a pain, and peeling the carrot is faster. 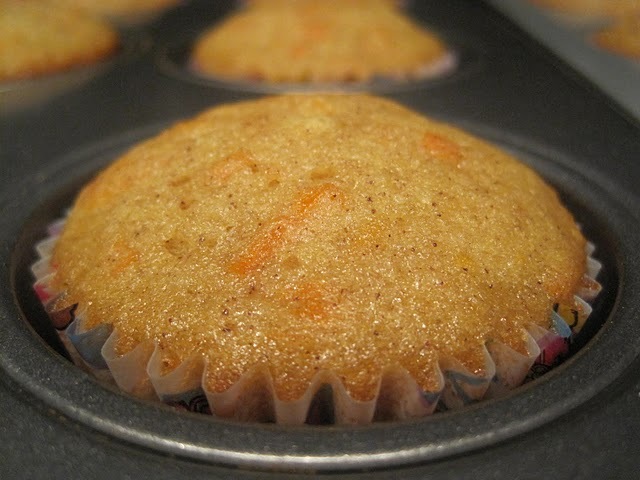 Additionally I think it creates a better cupcake. I figured this out when I lived in my beloved teeny 300 sq. ft studio apt in Chicago, and didn’t have space to have BOTH a grater and a peeler. Well, ya can’t peel with a grater, but you CAN grate with a peeler…. (of sorts). Anyways, this produces longer thinner strands, but I use my industrial strength scissors to just cut ’em up once they’re all bunched in a bowl. Sounds tedious, but it literally takes seconds. So, we have carrots. The other key? 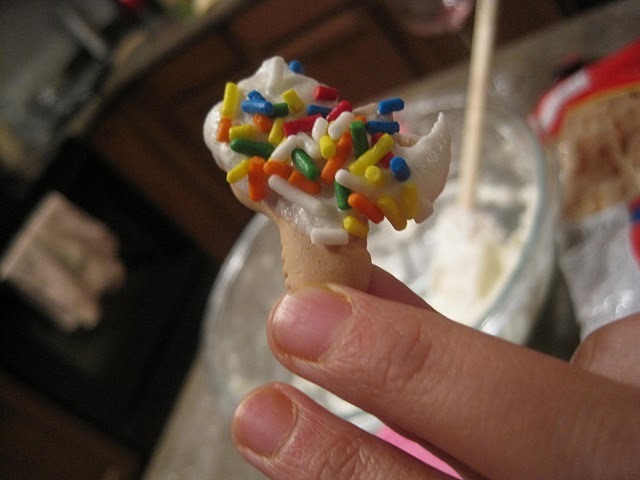 Cream-cheese-frosting- Y-U-M. 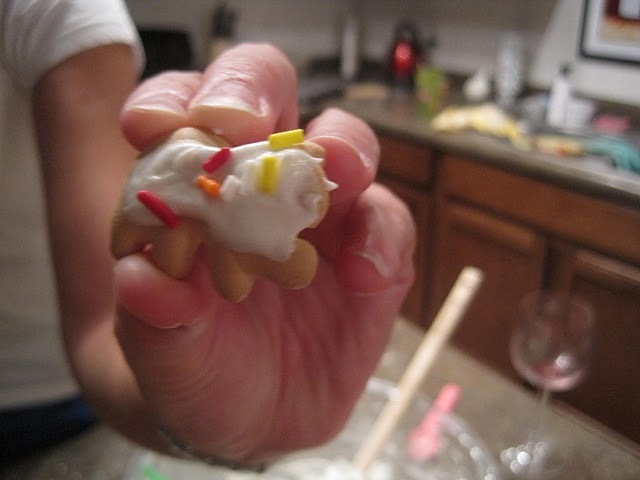 This just leaves one problem… what does one do with the leftover frosting?! Orrr… a LOT of sprinkles for a TON of FUN!!!!! !